It's no surprise to anyone who reads my wine reviews that I love red wines... especially a good Malbec, Pinot Noir, or Shiraz. Or Cabernet Sauvignon... or Merlot, or maybe Zinfandel or Chianti... and so on. Okay, I just really love red wine. So, here I am reviewing another red and yes, you guessed right, it's a Malbec. 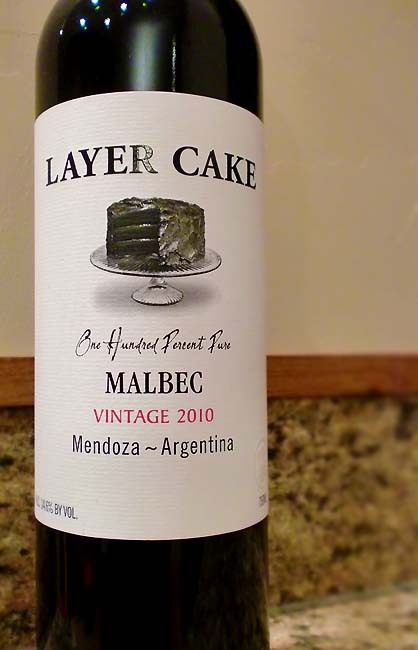 But, this isn't just any ordinary Malbec, this is the Malbec from Layer Cake, which is produced by Pure Love Wines. Now if you talk around, people seem to love Layer Cake wines. Don't confuse them with Cupcake Vineyards, although I can see where the confusion could lie (and yes, they both make good wines). Cupcakes and layer cakes? What's with all the cake named wineries? What's next, Devil's Food Cake Winery? Pancake Vineyards? Hmmm... pancakes. Delicious. Okay, I'm sidetracked now. Anyway, this is my first tasting of a Layer Cake wine. This is the 2010 Vintage Layer Cake Malbec. It pours a ridiculously dark purple with hints of ruby around the edges. The aromas are of blackberry, plum, and vanilla. On the palette, it bursts with strong, dark berries, raspberry, blackberry, raisins, black cherry, with a touch of rustic coffee/earthiness in the finish. This is a dark fruit bomb without being overly sweet that maintains a great balance. I love the contrast between the jammy notes and the rustic, earthy finish here. The only disappointing thing to me is how mild the tannins are. If the tannins were kicked up a notch or two, giving it a decent chewiness, then perhaps it would be my perfect Malbec. As it stands, however, it's still one of the tastier wines I've had in awhile. I need to pick up some bottles of Layer Cake's other varietals since this one surprised me. Drink This: if you want an excellent Malbec for the price (around $12-15). It's hard to find any Malbec near that price point that has this much depth and balance (although, Rebel Wine's The Show Malbec comes close). This Malbec is such a lovely dessert wine.